Considerable thanks to Lesley Daunt of the Huffington Post, for premiering the new video for the song "Thieves" by Thayer Sarrano. The video is the crafwork of Curtis Wayne Millard Studio, who draws inspiration here and more broadly from Stanley Kubrick and Terrence Malick. The work of CWM Studio has appeared in Rolling Stone, Spin, Billboard, Entertainment Weekly, and USA Today, among other outlets. The first video released from the album Shaky. This video was crafted by a video produced by Abel Klainbaum, in tandem with Thayer Sarrano herself. Klainbaum has operated as a cinematographer at a variety of cable networks, including: Animal Planet, HBO, A&E, truTV, and TLC. The second video released from the album Shaky. This clip is for the title-track. It was drafted, filmed, and crafted by the good people of Dominar Films, LTD. "Shaky" was voted the Music Video of the Year (2016) by the generous editors and readership of Flagpole Magazine. 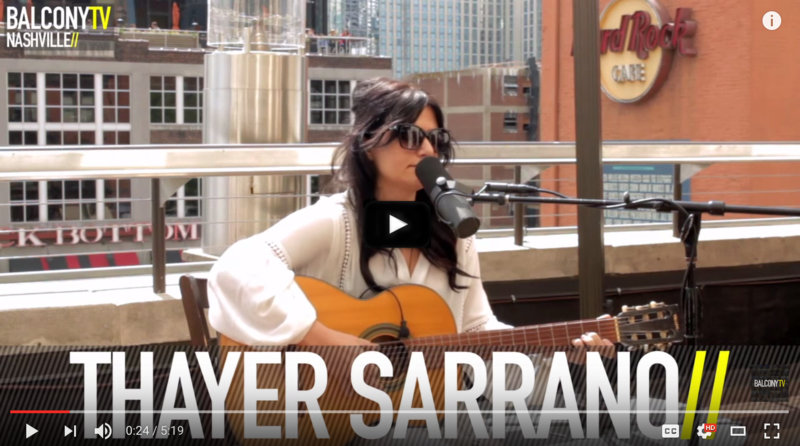 On the balcony of the Hardrock Café (Nashville), Thayer Sarrano offers an acoustic rendition of "Crease" for Balcony TV (Nashville). Bass, drums, keys are all jettisoned for the moment, so as to better appreciate her clawhammer classical guitar technique, her sonorous voice, her attention to songcraft, and her versatility. Cross-reference the Official Music Video for "Crease" (above) for versatility. Live video from the Shaky release show at the Seney-Stovall Chapel in Athens. Produced by Georgia State TV (GSTV) of Georgia State University. This is the song featured in the series Kingdom, on DirecTV's Audience Network, an AT&T Original -- Episode 19 of Season 2, entitled "Late to Leave," which aired on 27 July 2016. If you are a DirectTV and / or an AT&T U-Verse subscriber, you can watch the episode on-demand via the Kingdom website. Live video from the Shaky release show at the Seney-Stovall Chapel in Athens. Produced by Georgia State TV (GSTV) of Georgia State University.